Drivers using the M20 have been given a temporary reprieve with the lifting of Operation Stack, which involves lorries queuing to cross the Channel. 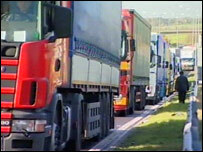 Coastbound lanes in Kent were partly closed for six days due to an ongoing strike by SeaFrance ferry workers. The M20 between junctions eight and nine was reopened after the backlog of lorries heading to France was cleared. However, police warn the closure could be reinstated amid fears the forecasted stormy weather could shut Dover port. The strike by SeaFrance workers has now entered its 11th day, with further action planned this week. As result, freight traffic has had to use the Channel Tunnel and other ferry operators to reach France. Non-commercial traffic heading for Dover, Folkestone and Eurotunnel is still being advised to use the A2 and M2 diversions to avoid delays. Kent Police said it would review the situation on Sunday night when severe gales are forecast to hit the UK, coupled with heavier freight traffic. The Freight Transport Association has estimated the disruption caused by the French industrial action has cost £500,000 a day. Director of external affairs, Geoff Dossetter, said the current bill stood between £4m and £5m, with delays to lorry drivers averaging four hours. "All transport costs inevitably have to be paid by the consumer," he warned. Kent County Council has confirmed it will reveal plans this week for a preferred location for a semi-permanent lorry park to ease the pressures caused by Operation Stack.